In this article I am going to disclose how to Upload multipart/form-data, picture,pdf,excel,etc.. to the server using Web API. Web API is essentially using as an mediator amongst client and server. It exposes the server side information to the client like (Website, Android , iPhone and etc..). 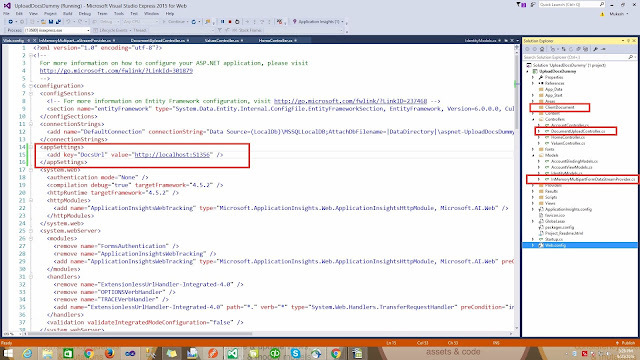 The client can specifically communicate with the server using Web API. Web API exposes the server information as JSON. 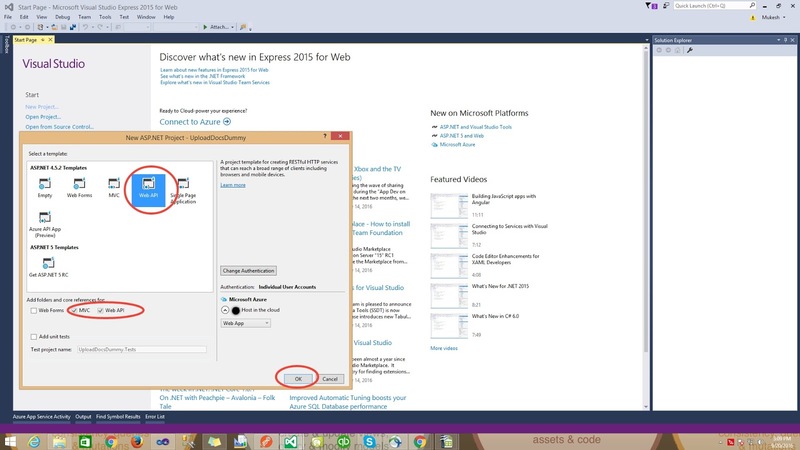 Here, I will explain today how to make a Web API to upload images,document,ppt,multipart/form-data, etc. server. and save on local folder.
" enctype='multipart/form-data' means.that is the type of content-type that no characters will be encoded in content . that is why this type is used while uploading files client to server. So multipart/form-data is used once a form requires binary data in content, like the file document,etc..."
How to work on web api? How to customize route in web api. 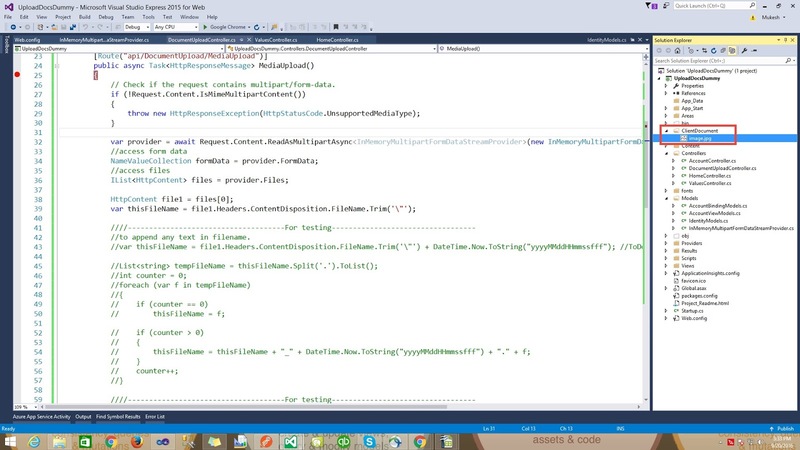 To upload multipart/form-data using WebApi follow some simple steps which are given below. 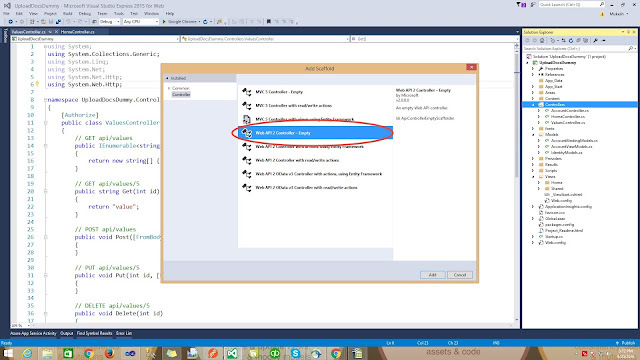 In this image you can see i have selected both checkbox "MVC" and "WebApi",so you can select both or only "WebApi". After click on "Ok" yo can see this image which are given below. According this image you can see there are model view and controller.so if you are beginner in MVC so learn architecture of MVC and flow. Step 2:-Create a empty folder "ClientDocument" in your application to save document/image ,etc.... You can see in next image which is already created. Step 3:- Create a model class "InMemoryMultipartFormDataStreamProvider" inside model folder and use this code ,in this code i am configuring multipart/form-data. after that use this class in apicontroller. Step 4:- Create a new apiController "DocumentUploadController" inside controller folder.see image.. Step 5:- If you have created a new controller "DocumentUpload" then create a new api (Action) "MediaUpload" like this. //to append any text in filename. In this code i have written code to save document in folder from multipart/form-data.also using "InMemoryMultipartFormDataStreamProvider"
Step 6:- Now we need to configure "DocsUrl" in web.config file. which are using in api code to get URL. Don't forget to configure this. Now we are ready to test api, see image.. 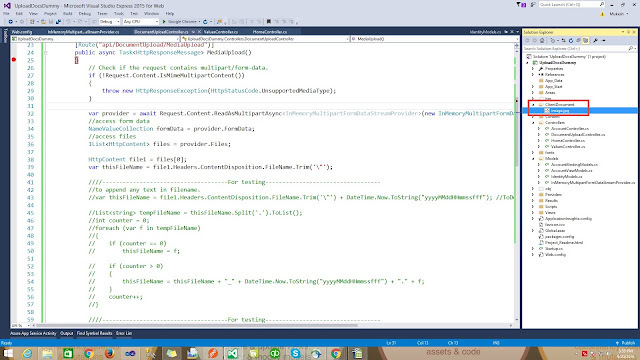 According above image i have created a key in web.config file and model,controller,folder. 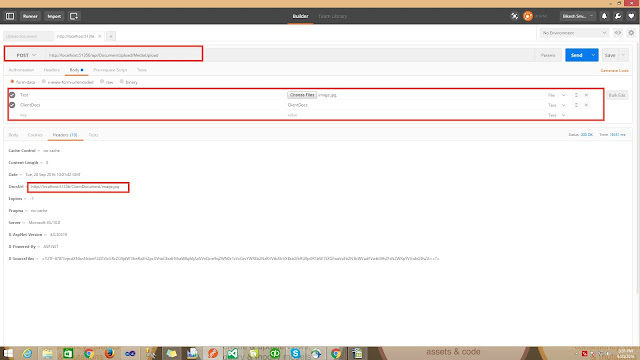 Step 7:-Run application and use postman to test web api. if you are not aware about postman click here.. other wise see image how to configure postman to test webapi. I hope you are good to post multipart/form-data. You can download this project which are already i've done. You have just read an article that categorized by title MVC / WEB API by title How to upload multipart/form-data in web api 2. You can bookmark this page with a URL https://bikeshsrivastava.blogspot.com/2016/09/part-36how-to-upload-multipartform-data.html. Thank You! 3 comments to "How to upload multipart/form-data in web api 2"
Yes definitely,wait for next article. 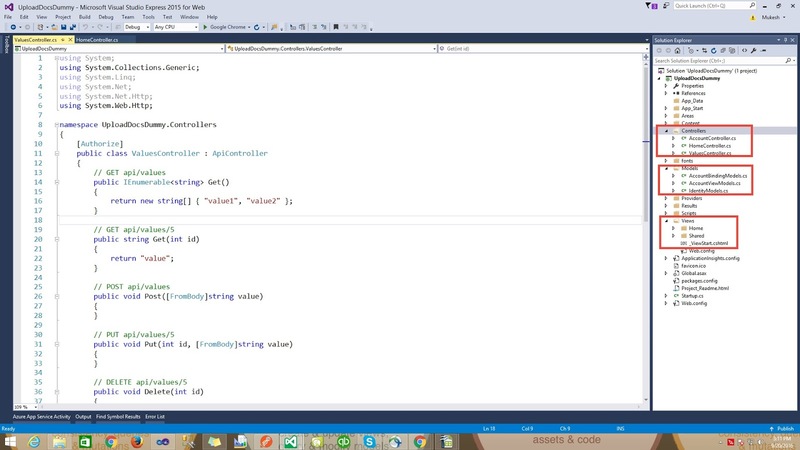 Swagger integration with web api in MVC.